Don’t you think the new you deserves a treat? Before you cringe, you should know we’re not talking about the cake, cookie, and ice cream variety. We’re talking about better-for-you snacks, healthy treats that nurture the new you—the one that’s been owning 2018 so far. Justin’s blends organic ingredients to make grown-up peanut butter cups worthy of your sophisticated, health-conscious self. 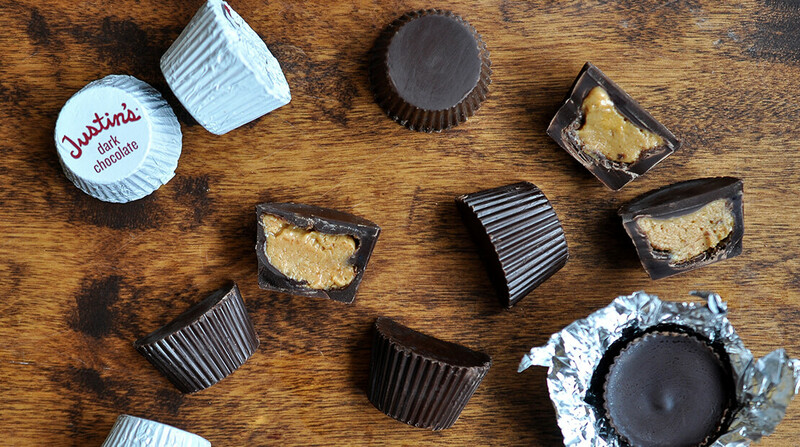 Don’t worry—the peanut butter cups of your childhood can’t blame you for ditching them. Treat factor: Organic peanut butter. Luscious fair-trade dark chocolate. Need we say more? Justin’s Dark Chocolate Peanut Butter Cups marry sweet and salty flavors like no other peanut butter cup on the market. Kiss your candy cravings goodbye; this cup’s rich flavors will stifle your inner sugar monster so you can get back to being a boss. Better-for-you factor: Honest, organic ingredients provide sweetness without making you feel guilty and gross later on. The dark chocolate coating is a level-up from less-healthy milk chocolate, and the peanut butter inside actually provides 4 grams of protein.